The produxct is sold in pairs with X1 red banana plug and X1 black banana incuded. 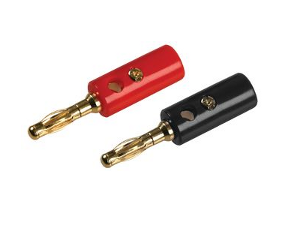 The plugs feature a hard coloured plastic body along with gold plated contacts. There is a cable entry hole of 3mm along with a screw termina for securing the cable in place.